The American Academy of PAs (AAPA) has launched a campaign affirming what DMU already knows: Physician assistants are important health care professionals who apply thousands of hours of medical training and versatile skills to providing patient-focused care. Called “Your PA Can Handle It,” the campaign explains that PAs are medical professionals “who diagnose illness, develop and manage treatment plans, prescribe medications and often serve as a patient’s principal health care provider. 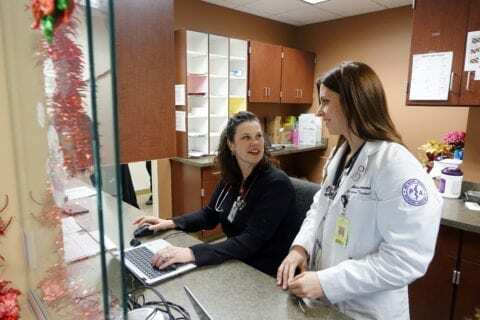 They practice in every state and in every medical setting and specialty, improving health care access and quality.” According to AAPA and other PA organizations, the nation’s 131,000 PAs have more than 400 million patient interactions per year. DMU physician assistant students learn in a pediatric “lab” on campus. The profession offers opportunities, too. According to the campaign, it made US News & World Report’s “Best 100 Jobs” and “Best Healthcare Jobs” lists in 2018. The Bureau of Labor Statistics notes the profession is among the fastest growing jobs in America. In addition, Forbes says it’s among the highest paying. Among the nation’s more than 260 (and growing) PA programs, DMU’s PA program is one of the oldest. It enrolled its first 11 students in 1981 and today is among the 238 programs accredited by the Accreditation Review Commission on Education for the Physician Assistant (ARC-PA). The 25-month program is among the shortest in length, and its students gain clinical exposure beginning in the first year. DMU’s PA program produces excellent health care providers, too. The Class of 2018 achieved a 100 percent first-time pass rate on the Physician Assistant National Certifying Examination (PANCE). Since 2014, the first-time pass rate has been 98 percent or higher, consistently exceeding national averages. The program’s ideal class size of 50 students and its highly experienced faculty create a collaborative environment. Suzanne Ware, a graduate of DMU’s physician assistant program, is a preceptor for PA students. Here, she discusses a patient examination with PA student McKenna Zimmerman during her rotation. Want to learn more about the PA profession and the advantages DMU’s PA program offers? The University offers opportunities to visit campus throughout the year. For more information, visit the admissions events website or send inquiries to paadmit@dmu.edu.